We’d love your help. Let us know what’s wrong with this preview of Dishcloths to Crochet by Pat Olski. Crocheters of all skill levels will delight in these playful patterns for crocheted dishcloths — they're as fun to make as they are to use! Animals, flowers, and fruits are among the themes of the 25 patterns, which include Sweet Strawberry, Perky Pig, Dandy Daffodil, and other designs. Full-color photos accompany the easy-to-follow instructions. The directions also show ho Crocheters of all skill levels will delight in these playful patterns for crocheted dishcloths — they're as fun to make as they are to use! Animals, flowers, and fruits are among the themes of the 25 patterns, which include Sweet Strawberry, Perky Pig, Dandy Daffodil, and other designs. To ask other readers questions about Dishcloths to Crochet, please sign up. I don't recall ever reviewing a crochet pattern book before so I'm not entirely sure what all I should say about it. Forgive me if this review isn't extremely long. The patterns in this book are extremely easy to understand and follow along with. The work produced by these patterns are way too cute. I think my favorites were the owl and the penguin! Crochet dishcloths are some of my favorite things to make, mainly because I love using them so much. There's that new scrubby yarn out and it works I don't recall ever reviewing a crochet pattern book before so I'm not entirely sure what all I should say about it. Forgive me if this review isn't extremely long. The patterns in this book are extremely easy to understand and follow along with. The work produced by these patterns are way too cute. I think my favorites were the owl and the penguin! Crochet dishcloths are some of my favorite things to make, mainly because I love using them so much. There's that new scrubby yarn out and it works wonderfully! The copy of the book I received for review purposes did not include pictures, but I did make every dish cloth in this book and they all turned out way too cute. One thing I really liked was that each pattern started out with the name of the pattern, suggested yarn, guage, notions needed and finished sizes. There was a stitch glossary included in the book, which was helpful. 25 whimsical patterns for colorful cotton dishcloths or potholders are provided in this book that includes easy to follow directions. The copy I received for review purposes did not have photos of the finished products but the cover was splendid so if the rest not shown on the cover are half as fun this should be a delightful book for anyone wanting to create charming dishcloths for themselves or others. Thank you to NetGalley and Dover Press for the ARC – This is my honest review. Dishcloths to Crochet includes full color pictures of 25 dishcloth patterns, ranging from traditional to whimsical. Dishcloths are such practical thing to crochet, and their small size makes them achievable in a short time. With such an interesting variety that I found myself a little indecisive when it came to picking which ones I would try. The dishcloths included are of a pleasing array, from very traditional flower in thread crochet to a quite fussy and impractical horse. Each pattern has a Dishcloths to Crochet includes full color pictures of 25 dishcloth patterns, ranging from traditional to whimsical. Dishcloths are such practical thing to crochet, and their small size makes them achievable in a short time. With such an interesting variety that I found myself a little indecisive when it came to picking which ones I would try. The dishcloths included are of a pleasing array, from very traditional flower in thread crochet to a quite fussy and impractical horse. Each pattern has a full-color image, the page lay-out is pleasing, and the directions are in an attractive and easy to read font. Whether you have thread, cotton, or other yarn on hand, there are patterns that will accommodate your preference and your yarn stash. I chose to try two patterns that, at my level of experience, should be simple to slightly challenging at most. What I found while working the patterns, or in one case attempting to work it, was not exactly what I expected. While one pattern contradicted the method obviously used in the accompanying picture, both had issues with the written instructions. According to the brief introduction, this is an assortment of patterns previously published in a 1980's pot holder book that have been edited and reworked by Pat Olski, which puzzled me as I take issue with the glibly stated (paraphrased here) just add a crocheted ring (we'll tell you how) to hang it by and it is a potholder. One use of these as a potholder that does more than hang prettily from its crocheted ring, but without a second crocheted or fabric layer, and my point is likely to be made. Though the book states that there are patterns suited to beginning crocheters, unless the finished version addresses these types of issues, then I would suggest that it not be attempted unless accompanied by a more experienced crocheter though I am hopeful that the two patterns I attempted might be isolated cases. This review refers to an e-galley read through NetGalley, courtesy of the publisher. All opinions expressed are my own. Wanted to review this book because I crochet and I continually make dish cloths as gifts and am looking for what's available now. Book starts with a short introduction and then a gallery of desings with names and brilliant colors and shapes. So many cute things to make. Lobster would be one of my favorites and penguin and crab-I live on the coast in New England. 25 whimsical animals and such. List of abbreviations and basic instructions for common things are included. Each pattern starts out with a title, finished size, yarn required, notions, gauge, stitch glossary and how to make the stitches then instructions for the item along with a color photo. There is no level of expertise mentioned but with all the instructions for these dish cloths even a beginner would have NO problem making any of these. Conversion charts for hooks are provided at the end. Super fun book now to get busy making them. Received this review copy from Dover Publications via Netgalley and this is my honest opinion. I normally don’t pay attention to dishcloth books. They are boring and repetitive to me. However this book caught my attention. There are different designs then I am used to seeing for dishcloths. Some I wouldn’t dream of actually using. I would use them as decoration. Even as appliques to baby blankets maybe! I love when I can come up with idea to use things that they where not meant for. The patterns seem well written. I haven’t been able to test them as my hands have been hurting very bad due I normally don’t pay attention to dishcloth books. They are boring and repetitive to me. However this book caught my attention. There are different designs then I am used to seeing for dishcloths. Some I wouldn’t dream of actually using. I would use them as decoration. Even as appliques to baby blankets maybe! I love when I can come up with idea to use things that they where not meant for. The patterns seem well written. I haven’t been able to test them as my hands have been hurting very bad due to my RA. However if I want to ever crochet dishcloths I will be buying this book. I don't know why it took me so long to review this book. I learned to crochet this summer and was able to make a few of these adorable patterns for holiday gifts. The owl is probably my favorite, but the bee is also adorable. In general, the instructions are easy to follow, the patterns work up quickly and easily, and the designs are simply adorable. This is a great book for every skill set and level. This is a great gift for any crocheter. It has quick easy to read patterns with a good color picture of each dishcloth. Animals and flowers make these cute to have laying around in the kitchen. These patterns are also good for using up leftover yarn from previous projects that are filling up your yarn drawers. Some very easy and others a little more advanced. I'll be making these for hostess gifts and for my own kitchen. I received this free ARC in exchange for a fair and honest review. I received an Advanced Reader Copy from NetGalley for my unbiased opinion of the book. I really enjoy making dishcloths in this book! I appreciated the abbreviation and no-nonsense patterns. I made the perky pig, wild watermelon. and busy bumblebee. I loved the quirky names for each project. I plan on working my way through this book and will make a great gift for my other crochet friends! These are cute and unique dishcloth designs! They are so adorable that I would just want to hang them as decoration. The instructions are well written and I think that people will enjoy crocheting them. Oh my goodness, so stinking cute! I loved using leftover yarn to make these quick and easy dishcloths. Patterns are easy-to-follow, with a nice picture of each finished item. Thanks to Netgalley and the publisher for a copy of this , I voluntarily chose to review. This book is full of innovative, fun little dishcloths to crochet. The patterns are well written and simple to understand, allowing crocheters of all experience to make them. The bee is on my list! Ready for the summer! Colorful collection of dishcloths for any occasion. Very easy step to step tutorials. This was filled with really cute designs. Some were too cute to use to clean dirty dishes, but could be adapted for other projects. Others seemed just right to update the look of dishcloth. I liked the plain squares that are embellished with motifs like lobsters, as you can add to existing cloths or just make the base if you want. I especially liked the pig and pineapple cloths. Patterns were easy to follow and most can easily be accomplished by an experienced beginner crocheter. This book has the cutest dish cloth patterns. You simply cannot go wrong buying this book. I like the patterns very much because they cheer up the kitchen and bring a splash of color to the kitchen sink. All 25 patterns in DISHCLOTHS TO CROCHET are adorable, offering a variety of different styles (from animals to flowers to leaves) for one to make. Several of the patterns are made using size 5 cotton, several in size 10, and several in either DK or worsted. I assume you could adjust your dishcloth as you see fit, but obviously you'd end up with a much larger dishcloth. This was actually where my one missing star came into play...I really prefer my dishcloths to be made of DK or worsted for durab All 25 patterns in DISHCLOTHS TO CROCHET are adorable, offering a variety of different styles (from animals to flowers to leaves) for one to make. Several of the patterns are made using size 5 cotton, several in size 10, and several in either DK or worsted. I assume you could adjust your dishcloth as you see fit, but obviously you'd end up with a much larger dishcloth. This was actually where my one missing star came into play...I really prefer my dishcloths to be made of DK or worsted for durability. Just a personal preference, but it's mine nonetheless. 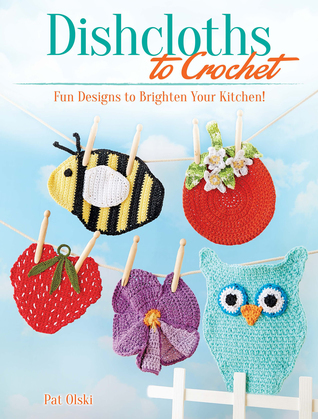 This book is full of cute crochet dish cloths! The directions are well written and easy to follow. I was able to make several of these cloths in a few hours each. The photos are good, and the finishing tips are handy. I would recommend this to anyone who likes to make cute dish cloths. Even the most experienced needle worker needs new inspiration and ideas sometimes. I've been crocheting the same patterns for many years but have now made many of the patterns in this book. Thank you for the wonderful additions to my kitchen!